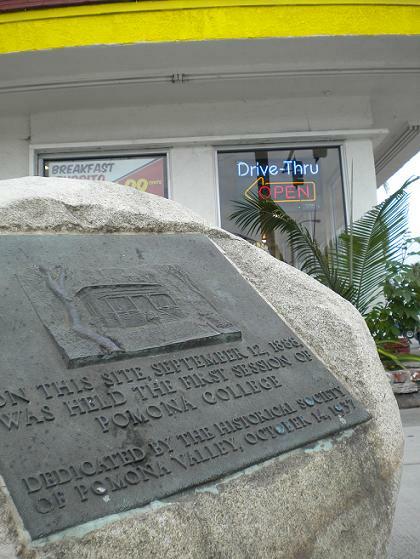 Column: Wait, Pomona College used to be in Pomona? 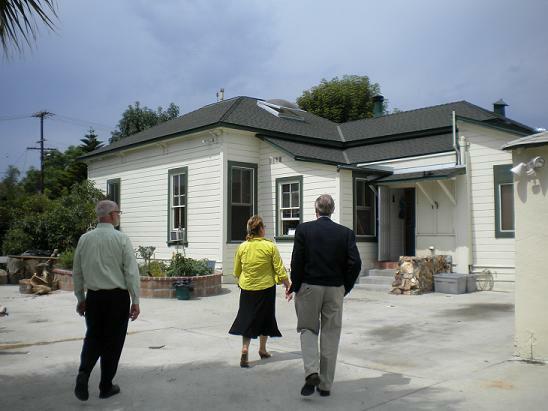 Sunday’s column (read it here) takes the president of Pomona College on a tour of two significant sites in Pomona: the corner where the college began in 1888, and the house, now relocated, that used to be on that corner. 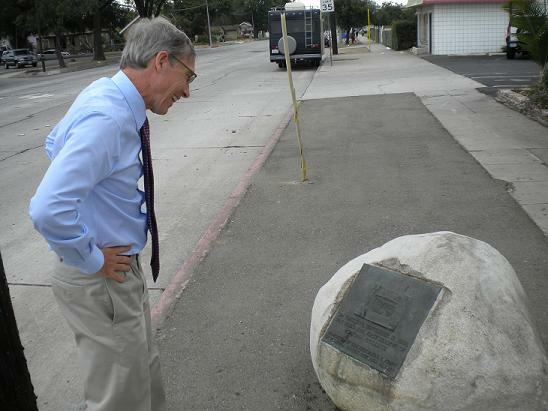 Above, David Oxtoby, the college president, admires the monument at Mission Boulevard and White Avenue that now seems incongruous outside Angelo’s Burgers. A thumbnail image of the plaque is at left. The home at that site, which constituted the entirety of the campus, was moved to Hamilton and Phillips boulevards in 1947. Below, college official Don Pattison, homeowner Maria Barajas and Oxtoby walk toward that home. Classes were held there for the fall 1888 semester only before the college packed up and moved to Claremont. As I understand it, the land was called Scanlon Mesa and was eyed as part of a new town that would be named Piedmont. Had the college been built there, perhaps it would have changed its name to Piedmont College. But a SoCal-wide land bust circa 1888 (not so dissimilar from our own housing crash) scotched a lot of big dreams, and Piedmont was one of them. The college is marking its 125th anniversary (the charter was granted Oct. 14, 1887). Here’s the anniversary website. Events are planned all year, but an open house and celebration are set for the weekend of Oct. 13 and 14.